Sanjay completed his B.F.A course in First Division and was 2nd merit in Nagpur University. 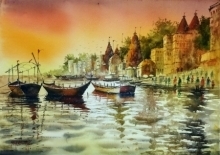 Sanjay started painting in all possible media. 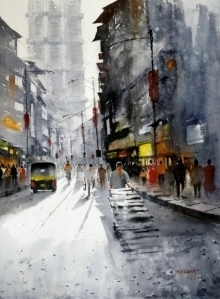 But one medium that attracted him a lot was watercolour medium and now, he is known as Watercolour Artist. Today he paints landscapes on location; each of his landscape paintings depicts real life. 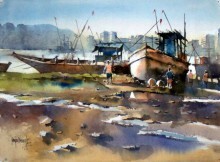 His paintings are close to nature. 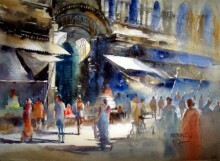 Light effects are the heart of his paintings. Till date he has bagged many noteworthy awards. 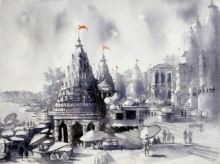 Born in Nagpur (Maharashtra, India), Sanjay Dhawale started his drawing career at the age of 8 years. He began with basic drawing. He was more interested in drawing than other subjects in the school. In school he used to take part in drawing competitions and won there at the First Level. 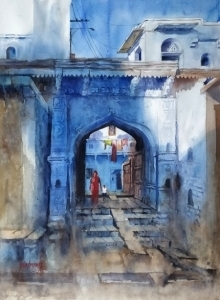 By observing his interest towards drawing and painting, his father, who was working in the High Court in those days, encouraged him by promoting to drawing and painting classes. His father was his moral support in his journey towards the Art of Painting and also during his busy schedule, Sanjay’s father used to motivate him by giving examples of world famous artists like Leonardo da Vinci, Picasso and Raja Ravivarma etc. Though there were some difficult financial conditions, his father tried to bring out the best in his son because Sanjay loved doing paintings rather than other academic subjects. After bagging those school competition awards and some city level awards, Sanjay passed the state level Elementary and Intermediate exams both in ‘A’ grade. Since then his interest towards painting grew more. After his 10th matriculation he requested his father that he wanted his career to be built up in the field of painting itself. His father therefore advised him to take admission in J.J. School of Arts, Mumbai for further studies, but due to some reasons or the other, he was admitted in Chitrakala Mahavidyalaya college in Nagpur in B.F.A(Bachelor of Fine Arts) , applied art course. In order to reduce some financial burden on his father and also to fulfil his painting requirements, he joined ‘Lokmat Newspaper’, Nagpur as a part time job. After college he used to go to press and do some story illustrations, sketches and cartoons for the newspaper. For this he used to be paid Rs 30 per illustration in those days. 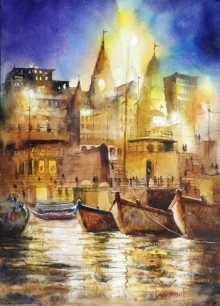 Meanwhile he used to do LANDSCAPES every Saturday and Sunday, visited public places like railway stations, bus stations, temples, vegetable markets and painted in live different activities going on there. Sanjay completed his B.F.A course in First Division and was 2nd merit in Nagpur University. He was offered a job of Drawing Lectureship by Government of India but he had different plans for himself and therefore could not accept the same. 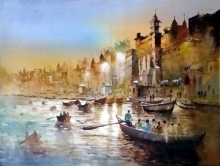 Sanjay decided to go to Mumbai as he wanted to learn and achieve something more in the art of painting, in addition to what he obtained till date. In Mumbai he joined the famous advertising agency named PERCEPT. There he got associated with campaign for brands like Siyarams, Danabhai Jewellers and Pantaloons etc. There he earned a good income but he had no time for his paintings. After some time he joined LIC of India (Advertising department) and today also he is associated with it. Here he got some time for landscapes paintings. Between these years he explored much in the art of painting. 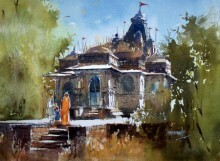 Sanjay started painting in all possible media. 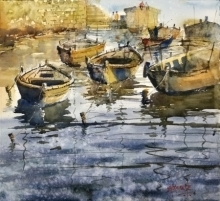 But one medium that attracted him a lot was watercolour medium and now, he is known as Watercolour Artist. 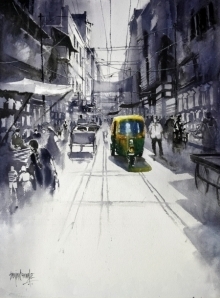 Watercolour is very tough and challenging medium but he loves to get along with those magical transparent colours, to play hide and seek with the lights and shadows. Today he paints landscapes on location; each of his landscape paintings depicts real life. 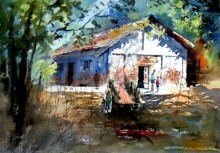 His paintings are close to nature. 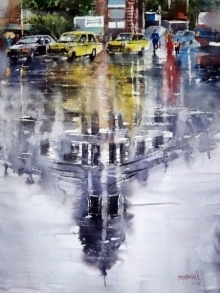 Light effects are the heart of his paintings. 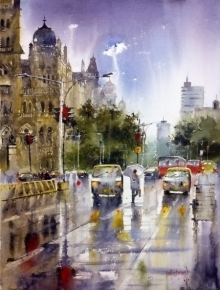 Sanjay daily paints one landscape. 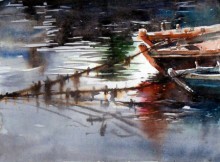 He is a self-taught artist and learns something daily from his own paintings. He took inspiration from his favourite artists like Alvaro, Castagnet, Vasudev Kamath and Milind Mullick. 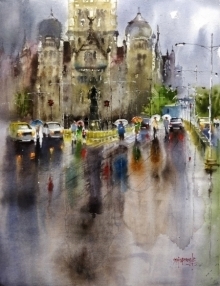 “Mridula Lunker Award” 2013 for the Best Watercolour from ICAC ART Society. 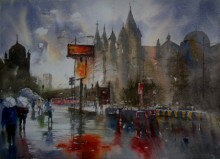 2nd Award winner for Best Watercolour Landscape in “International Art Contest”. Group Painting Exhibition in Ravindra Natya Kala Academy, Prabhadevi (Dadar), Mumbai in 2013. His name was shortlisted in the top 30 artists from all over India for ARTIST CAMP at Nagothane organised by ICAC in the month of June 2013. 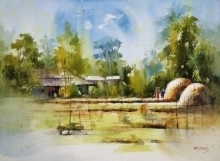 His landscape has been exhibited in the painting exhibition by ICAC in Nehru Art Gallery in December 2013 in Art Fair. His BIO_ GRAPHY was Published “Indian Talent Magzine” in January 2014 Issue. 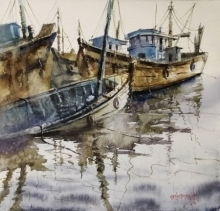 His Painting was selected for State Art Exhibition 2014. 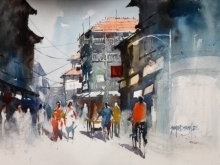 His Painting was selected for Art Society of India Annual Art Exhibition 2014. 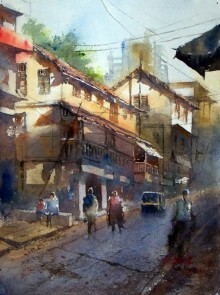 Vishal Bhai Shah Award for Best Watercolor Landscape from ICAC Art Society. His BIO_ GRAPHY was Published “ Dombivlikar Magzine” in Decembery 2014 Issue.